I used my homemade iPhone telescope adapter mount to hold my phone over the eyepiece (digiscoping). 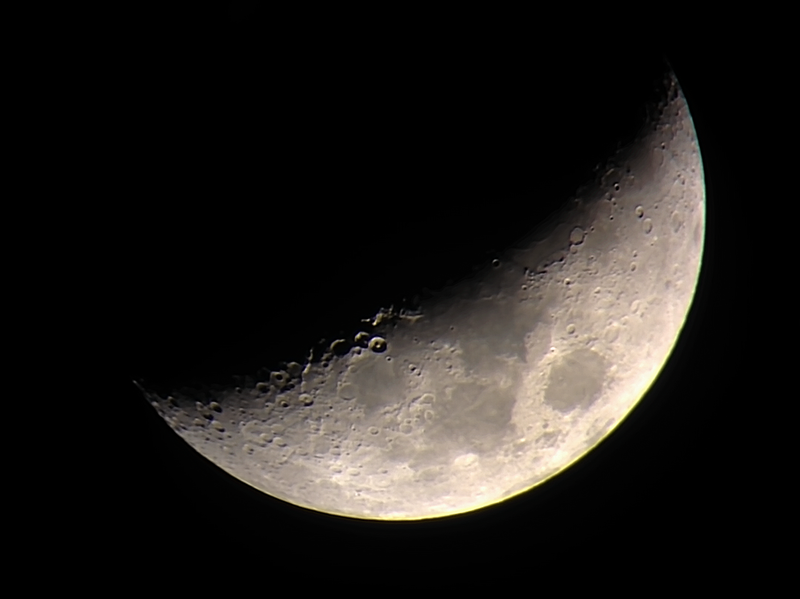 I used a 9mm eyepiece on a vintage Meade 285 (60mm, 900mm, f/15). I took the video on March 6, 2014 at 10:32pm ET. Next, I converted the iPhone MOV file to AVI to work with it in Registax. I also have a blog post outlining that process using the conversion software Streamclip MPEG. Once it's an AVI file, you can "stack" the video in Registax similar to a stack of still photos. Here is a short video I put together with slides of my mount construction, the raw MOV file (very shaky because I was actually holding it in the right position over the eyepiece), and the final product. It's amazing how Registax is able to pick out the best bits and align them even with a shaky video like this! 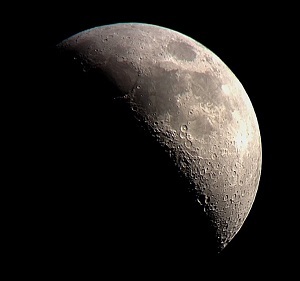 Obviously the moon photo needed to be flipped horizontally to compensate for the angled mirror in the neck of the telescope just before the eyepiece. Hmmm, I bet this has a technical name. [Looking it up] It does! A star diagonal - how pretty.